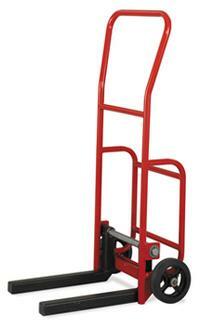 Model VC-F85261A0 - Flat Forks - 18 3/8" x 4"
Model VC-F85264A7 - Transmission Forks - 18 3/4" x 2" x 2"
The Multi Use Cart makes transferring heavy transmission cases, engines and cumbersome part’s bins a safe and efficient task, especially in the automotive industry. Add safety to your workplace and incorporate this heavy-duty transmission case truck within your distribution center, on your semis and inside your garage area. Order the frame and choose from heavy-wall 2" sq. adjustable steel tube forks (Pic. 3) or adjustable flat forks (Pic. 2). Model VC-F85261A0 (PIc. 2) - Flat Forks - 18 3/8" x 4"
Model VC-F85264A7 (Pic 2) - Transmission Forks 18 3/4" x 2" x 2"